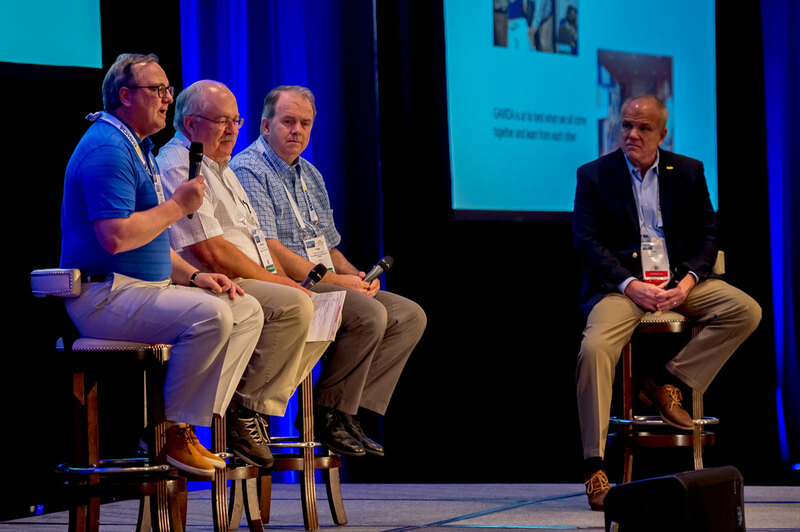 GAWDA Consultants present about how and when to contact them as well as the ease of their availability, in a panel discussion during the Spring 2018 SMC with 2017–2018 GAWDA President Ned Lane. GAWDA distributor and supplier members generally know their stuff. They know their customers, they’re aware of the newest models of goods on the market and they understand the ins and outs and operational necessities of the gases and welding distribution business. Because they’re so involved with the day-to-day, though, they may not be as up-to-date as they’d like on the myriad issues that envelope the industry. Still, there are legal, safety and regulatory requirements and demands that are integral to their business functions and are an essential part of their operations. Those matters frequently change or have updates. That’s where GAWDA’s tried-and-true consultants come to the aid of members. Experts in legal issues, legislation, safety standards and regulatory matters emanating from the federal agencies that weigh in on industry functioning, GAWDA’s consultants do stay up-to-date and fully informed. They are on top of the latest rulings and determinations from government agencies — the Environmental Protection Agency, the Occupational Safety and Health Administration, the Department of Transportation and the Food and Drug Administration — and how those changing issues affect member businesses, routine operations and compliance standards. GAWDA’s long-standing consultants are available to each member company, quickly and easily, whenever needs arise. Most are ready to work with members at the drop of a phone call or an email. GAWDA’s consultants can be called into service by members who are in the midst of an on-site inspection or a roadside stop. And their availability and expertise often provide quick, streamlined answers to questions that can rise unexpectedly and situations that can otherwise mean some worrisome moments. Their knowledge translates into tangible benefits, and their abilities, awareness of policies and procedures, as well as their insights, often save members significant amounts of time, trouble and money. The availability of all three GAWDA consultants is one of the prime benefits — and an exclusive one — of association membership. The services of the consultants are available without charge, almost without exception. At the GAWDA 2018 Spring Management Conference, President Ned Lane introduced all three and took the opportunity to provide attending members with more detail about the level of expertise and availability of the consultants as a key component of the benefits of membership. Lane noted that no matter the size of the member company, GAWDA’s consultants are at a distinct advantage because they operate as consultants to each individual member. He urged members to make use of their expertise: “Regardless of the size of your company, these guys are part of your team,” Lane explained. “If you’re a small company, they’re a resource. If you’re a big company, these guys are someone to bounce your ideas off.” As he introduced each consultant, he turned the microphone over so each could add their comments. Mike Dodd has spent 44 years in the gases and welding distribution industry and 18 as a GAWDA consultant. He described his familiarity with the federal agencies that issue and uphold regulations in the industry, such as cylinder filling and requalification. They include the Department of Transportation, the Occupational Safety and Health Safety Administration, the Department of Homeland Security and the Environmental Protection Agency. He said since most distributors have at least one delivery vehicle, “if that describes your company, you need to talk to me.” Dodd says he typically responds to as many as 400 calls a month, on average, and is available for consultation even as DOT inspections are happening, on the spot. “When the DOT inspectors are there, call us,” he added. “We can immediately start on an action plan and help you get the situation fixed before you get the citation letter back. If you have a violation, what the agency wants to see is that not only did you correct the violation, but you put safety management practices in place.” In those situations, he said, he can help members illustrate that they have changed their processes to avoid recurrences and that the company’s safety management program is settled. In his experience, Dodd said, if a very concerted effort to correct a situation is illustrated up front, penalties often can be reduced. Tom Badstubner consults with members in the areas of the Food and Drug Administration and Medical Gases and Special Gases regulatory issues. He offers a comprehensive FDA food and medical gas technical support program and administers the GAWDA medical gas standard operating procedures program. He is also responsible for conducting monthly free online food gas roundtables and other training. He reported that he averages about 21 calls a day from members, and he’s also available via email to advise on various aspects of operations. He’s quick to respond to member questions about procedures and technicalities and is available to help with walk-throughs of actual situations, he said. All of the consultants publish articles in each issue of GAWDA’s magazine, Welding & Gases Today, detailing situations and remedies, as well as issuing alerts and legislative updates. They also issue updates through the twice-monthly GAWDA Connection e-newsletter. Click here for a list of the types of issues and regulatory matters on which GAWDA’s consultants are available for questions and advice.